On Sale Now! Save 8% on the Bolbove Big Dog Hooded Raincoat Slicker Rain Poncho Waterproof Jacket for Medium to Large Dogs (8, Green) by Bolbove at People For Pets. MPN: 4334716444. Hurry! Limited time offer. Offer valid only while supplies last. Our heavy-duty, waterproof rain jacket keeps pets dry in wet weather and saves owners from the hassle of wet dog smell and extra coat maintenance. Our heavy-duty, waterproof rain jacket keeps pets dry in wet weather and saves owners from the hassle of wet dog smell and extra coat maintenance. Preferably Suitable Dogs: such as Golden Retriever, Samoyed, Akita, Labrador Retriever, Brittany Spaniel, Huskies, Bulldog, Collie, Schnauzer, Springer Spaniel Breeds, etc. Sizes fit different Small, Medium and large dogs (Please choose the size carefully before purchasing). Size 6: Fit dog's Neck Girth 13"-14", Chest Girth 20"-23" and Back length 15". Size 8: Fit dog's Neck Girth 15"-17", Chest Girth 25"-28" and Back length 20". Size 10: Fit dog's Neck Girth 18"-20", Chest Girth 30"-33" and Back length 24". Size 12: Fit dog's Neck Girth 21"-24", Chest Girth 35"-38" and Back length 27". Q: Still worry about your beloved pets getting wet or catching a cold after walking or playing outside in the rain. A: With this piece of raincoat, just let your pet walk and play happily even on rainy days! Material: This raincoat is 2 layers design. Outside waterproof material 65% Nylon & 35% Polyester and Inside mesh fabric 100% Polyester. Using professional outdoor clothing material, it combines high waterproof, high breathable and high durable characteristics. Adjustable belly strap ensure a secure and comfortable fit. Color stitching design highlights its stereoscopic sensation. Dog model of the photo: 1-year-old Border Collie Weighs 35 pounds and wears size 8 poncho. 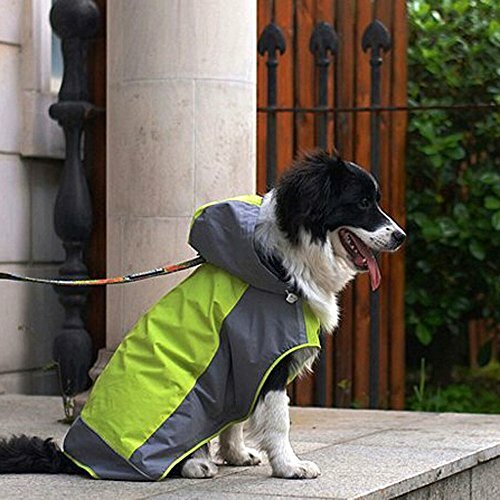 Waterproof rain jacket keeps pets dry and comfortable in the rain.